Ballyclare's Gareth Maybin made seven birdies in a three under 69 to jump into a share of 20th heading into the final round of the 104th South African Open Championship. After losing his card last year, the 34-year old needs a decent start to the season and he could get it at Glendower Golf Club after moving up 14 spots to three under par. He's a massive 10 strokes behind leader Charl Schwartzel, who birdied his first four holes and fired a six under 66 to lead by five strokes on 13 under from Matt Fitzpatrick and David Drysdale. “It was a bit of a mixed bag out there,” former Masters champion Schwartzel said after making eight birdies and two bogeys. “I’ve found something for my swing, and I hit some great iron shots and good tee shots. Fitzpatrick shot 67, going out in 37 before racing home in 30 thanks to four birdies and an eagle three to share second with Drysdale, who shot 68. Lee Slattery is fourth, six off the pace on seven under after a best of the day 65. Gareth Maybin fired a costly 75 to finish tied 38th as former Walker Cup player Andy Sullivan claimed the South African Open after a playoff with overnight leader Charl Schwartzel. 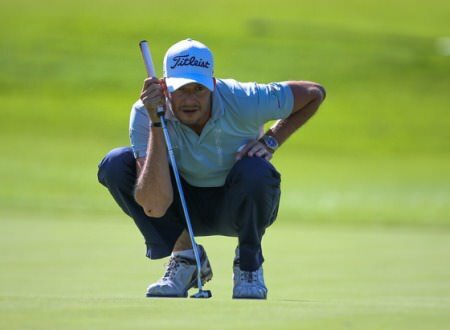 Ballyclare's Gareth Maybin scorched into the first round lead thanks to a course record, seven under par 64 in the BMW Italian Open at Royal Park near Turin. Gareth Maybin is tied for 43rd in the SA Open. Picture Eoin Clarke www.golffile.ieGareth Maybin needs a low final round in the South African Open to avoid falling outside the top 118 who will retain their European Tour cards following next week’s Hong Kong Open. Simon Thornton slipped to the back of the field as pre-tournament favourite Charl Schwartzel took a one-shot lead into the final round of the South African Open Championship hosted by the City of Ekurhuleni. Kevin Phelan continued his impressive start to his professional career with a solid third round 68 in the Alfred Dunhill Championship at Leopard Creek. The Waterford talent, 23, leapt from the cut line to joint 15th on four under par as he missed just two fairways and scrambled brilliantly, carding five birdies and just one bogey at one of the most punishing venues on the European Tour schedule.